From left, Tom Horton, GTRI Director Bob McGrath, Shatanese Reese, Carlos Alas, Bianca Palacio, Victoria Falk, Joe Luck, Mike Harris (back row), Tom McDermott and Jim McGarrah. The Georgia Tech Research Institute (GTRI) invests in students, and the return on that investment pays dividends every day. With more than 300 students currently filling roles at GTRI, senior leadership created a new way to recognize, honor, and recruit talented students. 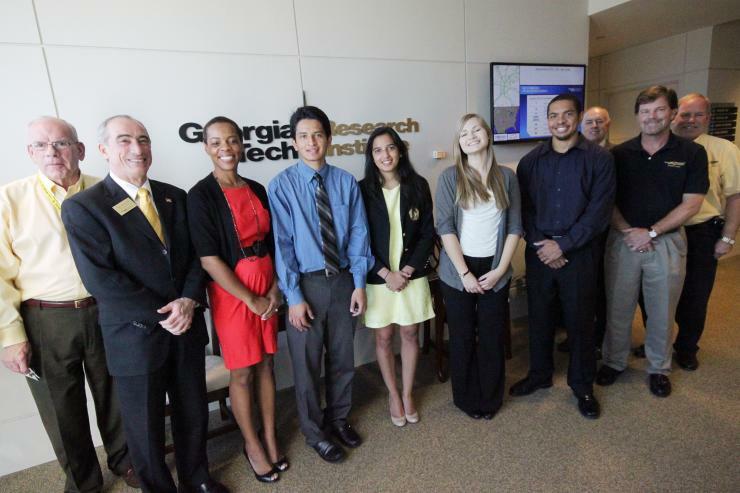 In October, GTRI awarded $40,000 in scholarships to four students at Georgia Tech: Carlos Alas, a mechanical engineering major from Naples, Fla.; Victoria Falk, a chemical engineering major from Lilburn, Ga.; Joseph Luck, an electrical engineering major from Summerville, S.C.; and Bianca Palacio, an industrial engineering major from Ridgewood, N.J. Already, Mr. Luck, an EE junior and an Army veteran with a background in electronic warfare, has been hired in the Electronic Systems (ELSYS) Laboratory at GTRI as a student assistant. The committee that selected the recipients was led by Human Resources Consultant Shatanese Reese, and included GTRI Deputy Director of Support Lisa Sills and GTRI Chief of Staff Tom Horton. Scholarship eligibility criteria were provided to the Georgia Tech Financial Aid Office, which reviewed their database of students and provided GTRI with potential scholarship candidates. “These are incredibly gifted students, and I’m glad GTRI could be a part of their educational opportunity,” McGrath said.